It really does look like a living cartoon. Very cool. 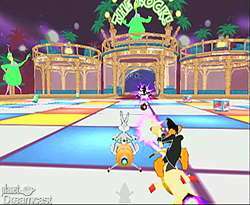 Luckily, Looney Tunes Space Race is almost as aurally appealing as it is visually stimulating. 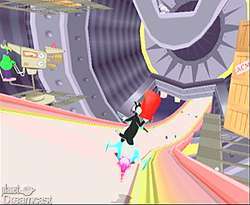 Every whistle, horn, explosion and rocket blast sounds as if it jumped straight from the cartoons and into your Dreamcast. The effects sound very clear and fit perfectly to the images being displayed onscreen. In addition to the super sound effects, players are treated to some fabulous voice acting. Though many of the voices (if not all) could have been sampled straight from the cartoon series, it really doesn't matter. The voices are funny, crisp, and pertain directly to onscreen action. Also, they serve to really draw the player into the Looney Tunes universe. And while soundtracks tend to be the Achilles' heel of many racing games today, this is not the case in LTSR. At first, I didn't even notice the music. It's turned down very low in the game's audio mix, even when turned up to the highest volume. Hence, it tends to get drowned out by the sound effects and voices. But, if you pay attention to it, the music is really very good. Whimsical themes and cartoony choruses make up this game's accompaniment, and not only are they fitting, they are also pretty good to listen to. Really, I find this soundtrack quite pleasant after being bombarded by the horrible techno music I suffer through in most racers. There has yet to be a perfect game, and Looney Tunes Space Race will definitely not take that title either. While you've heard me praise the graphics and the marvel that is cel shading, there are still some visual flaws haunting the title. Firstly, the framerate is a bit jumpy. While the game attempts to run at a constant 30 FPS, it can't quite hack it when there are many racers onscreen at once. I also would have liked to see the game running at 60 FPS. I'm not sure if a bit more development time would have made this possible or not, but that alone would have made this game even nicer to look at. There is also a noticeable amount of draw-in throughout the tracks. Sometimes the background will draw in at very short distances, which is annoying. Further, parts of the tracks will even flicker in and out of view for a bit before becoming fully visible. It's not too distracting, but it is noticeable if you are looking for it. But, to be honest, these graphical glitches don't really hamper the gameplay much. The wobbly framerate is definitely the largest problem here. Large, beautiful environments are the order of the day -- just watch out for a bit of pop-up. Unfortunately, there are two very frustrating aspects of Looney Tunes Space Race that deserve mentioning, because they do put a damper on the overall gameplay experience: Enemy AI (or lack thereof) and the cheap weapons. This game is very easy. The five computer-controlled drivers you race against are very easy to catch up to, even if they somehow happen to get a large lead. They seem to drive much slower than the player and rely too much on the weapons to gain positions. Not only that, but they also drive off the track, sometimes in the same spot lap after lap. Having a turbo boost near the end of a race is more important than driving well throughout its length. This is because, as I stated before, it's very easy to catch up to your competitors. So just boosting past them at the end will usually be enough to secure you the gold medal. Either that, or make sure you have a weapon. Which one, you ask? To be honest, any of them will do. And that's the problem. Every weapon in this game, except maybe two of them, (the boxing glove and the bomb) do not require the player to aim at all. It's basically like playing Super Mario Kart with only red turtle shells. And while at first the weapons seem unique and funny, they will eventually get on your nerves when you realize there is no way to get away from them. Sure, you may be able to use your turbo to get away from a piano or two, but it still ends up feeling like luck. There is really no "skillful" way to dodge most of the attacks of enemy racers. Very annoying. As you might imagine, this also has some consequences for the multiplayer experience, which loses a bit of luster thanks to the low skill ceiling. Looney Tunes Space Race is an above average kart racer on a system where this sub-genre is quite lacking. This fact alone should set it at the top of the heap for the many Mario Kart or Crash Team Racing players out there. This game features superb graphics, a great soundtrack, detailed environments, and good control. And while there are a few problems with enemy AI and cheap weaponry, there is still a lot of fun to be had with this title. The fact that the game carries an MSRP of $29.99 makes it even more appealing. To be honest, you probably won't find a better kart racer on the Dreamcast, and that alone makes this a good buy for fans of the genre. Highs: Great use of cel-shaded graphics, excellent soundtrack, good control, detailed game world. Lows: Weak enemy AI, overly cheap weapons, a few graphical shortcomings.